Today we’re thankful for Perugia. And knowing how quickly this last month will fly by for the Fall 2010 students, the Umbra staff have put together a list of Umbra’s Top Five Must-Do’s before you leave — so get out there and be thankful for all Perugia has to offer! 5. Taste free chocolate at the Perugina factory. 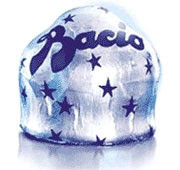 Most of the Italian classes have toured the home of the world-famous chocolate and hazelnut baci, but if you missed out, pick up a bus ticket and go on your own for a free tour and tasting! 4. 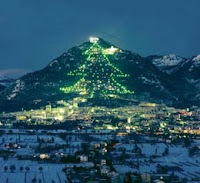 Celebrate the holidays in Gubbio with the World’s Largest Christmas Tree. Every year since 1981 the Umbrian town of Gubbio lights up the world’s largest Christmas tree, stretching across the mountainside between the Basilica above and the town below. The tree will be lit for the first time this year at 6:30 pm on December 7th. Gubbio is easily reachable by a 1-hour bus ride from Piazza Partigiani (one-way ticket costs about 4.50 euro). Make a quick trip one evening after sunset or stay over in Gubbio for the night! 3. Walk through the “underground city,” over the Roman aqueduct, and into the Duomo. We walk past these landmarks around town everyday, but have you ever actually been inside? Perugia’s most interesting historical sites are all free and right here in the center: the Roman Aqueduct, the Etruscan Well, the Tower of Sant’Angelo, the Duomo, and the Rocca Paolina. Talk to Zach if you need help finding these spots. 2. 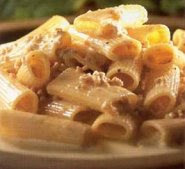 Eat Pasta alla Norcina, Torta con Salsiccia ed Erba, and Hot Chocolate from August Perusia! Pasta with Umbrian sausage and truffles, trypical Umbrian bread, and to-die-for hot chocolate… you can’t go home without trying these Perugia specialities. And while you’re at it, fresh olive oil, vino novello, and roasted chestnuts are all in season! 1. Ride the Ferris Wheel in Piazza Italia!